There is a picture of Amal and George arriving in Berlin up on Getty. And it looks like Gio is there. Berlin - starts the 66th Berlinale in the capital on Thursday. 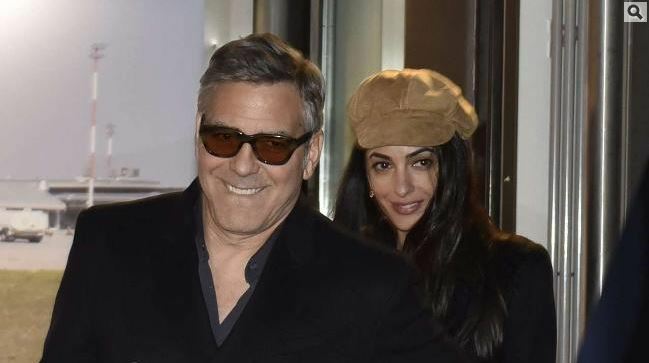 On Wednesday evening there was already reason to celebrate: Hollywood star George Clooney (54) has landed with his wife Amal in Berlin! 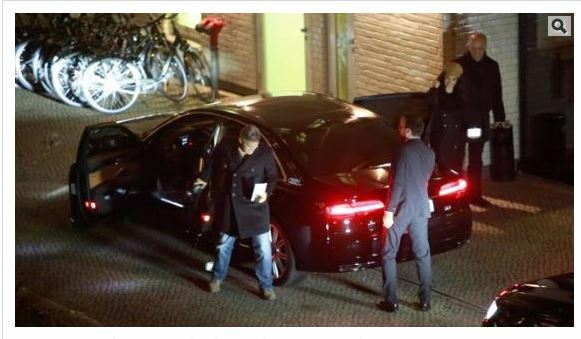 Even the man: Clooney dragged his own luggage to the car! ► At 17:10 were the actor, his wife Amal and the team of the opening film in Tegel landed (with scheduled airlines British Airways 994 from London). The celebrity guests were allowed to leave the airport through the VIP Terminal, then went directly to the Soho House on Torstrasse (Berlin-Mitte). On Thursday George is the star of the Berlinale opening film "Hail, Caesar!". The film, which accompanies a man behind the scenes of a Hollywood production runs, out of competition. Many other stars like Julianne Moore, Kirsten Dunst, Meryl Streep and Emma Thompson are expected to attend the International Film Festival in Berlin (to 21 February). They look so cute arriving . They are really cute together . 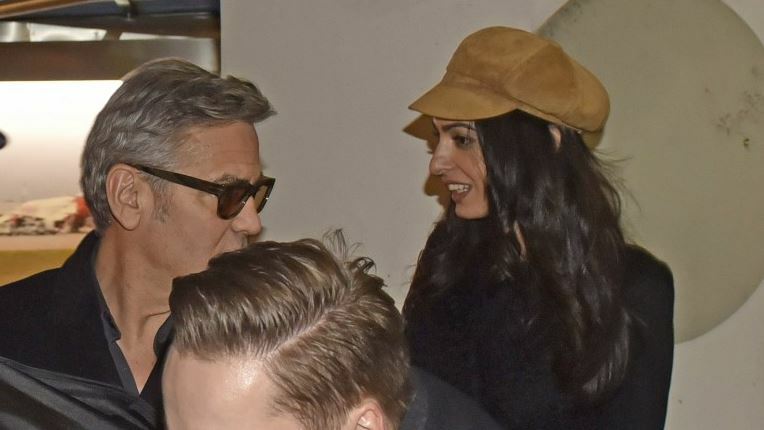 There's no denying she's got an impeccable style sense but Amal Clooney veered away from her signature look somewhat for her flight to Berlin on Wednesday. The high-flying lawyer attempted to go incognito as she concealed the most part of her face beneath a tan suede baker boy hat as she and husband George were pictured arriving in the German capital ahead of the annual film festival. Amal, 38, was uncharacteristically dressed down but managed to pull off the casual ensemble which was mostly black with a few quirky touches. The Lebanon-born activist slipped her slim frame into a pair of black-wash jeans, featuring horizontal rips on the knees. Amal warded off the plummeting temperatures by wrapping up in a black textured coat which she wore fastened and which rested on her thighs. She wore a plain black polo-neck top beneath the cover-up but made more of a statement when it came to her choice of footwear. The serial heel-wearer prioritised comfort as she pulled on a pair of flat knee-high boots which were emblazoned with classic leopard print all over and afforded the mostly-black look a welcome contrasting edge. 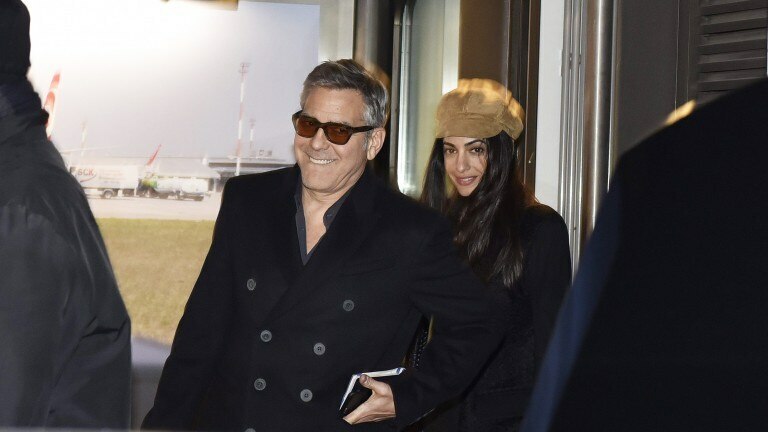 Despite the frenzy surrounding Amal and George's arrival to Berlin Tegel Airport, she seemed in good spirits as she was pictured smiling beneath the peak of her headwear. The talented Hollywood actor echoed his wife's mood as well as her keenness to disguise herself. 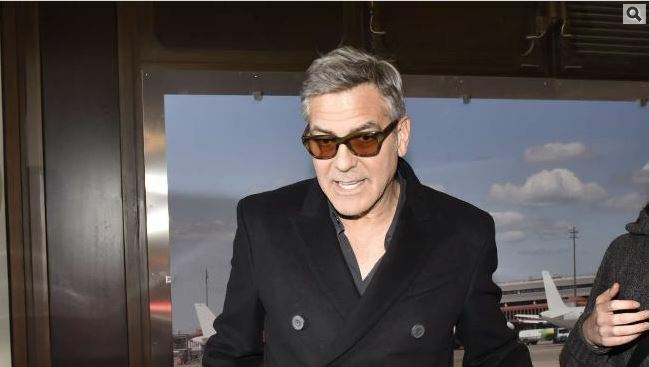 George, 54, dressed down in a pair of bootcut jeans, a black pea coat which he styled with a partially unbuttoned shirt and a pair of blacked-out sunglasses. He played the perfect gentleman by ferrying the married couple's luggage from the terminal building to their chauffeur-driven vehicle. George and Amal were closely followed by his Hail! Caeser! co-stars - Tilda Swinton, Channing Tatum and Josh Brolin. Tilda, 55, was evidently keen to go unnoticed as she made an effort to disguise herself in a look which wasn't dissimilar to Inspector Gadget. The legendary actress sported a long navy double-breasted coat, a matching fedora hat and a pair of aviator sunglasses. Channing, 35, followed her lead as he boasted his own take on the wining combo. He took an original approach to smart-casual dressing as he wore a white shirt - which was partially unbuttoned and hung loose over his waistband - and a denim waistcoat. Meanwhile, Josh, 47, prioritised comfort and favoured black tracksuit bottoms, a matching T-shirt, a purple V-neck jumper and trainers. Thanks for all the pictures and info. And Gio was there to point out their car ! Lol. 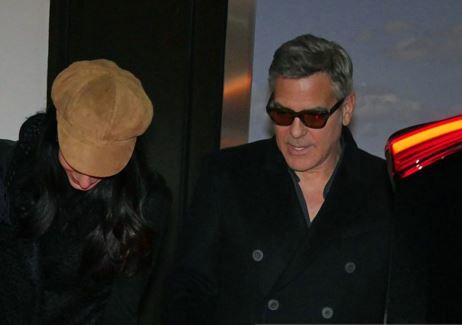 These pix show how slight Amal is next to George when she has flatties on. They look like such a fun couple, don't they? Oh Amal, fashionista you are not. party animal - not! wrote: Thank you everyone! No matter if they just had stopover in Heathrow (there are no BA nonstop flights from LA to Berlin) they can't have been out in LA Tuesday night and landed in Berlin Wednesday afternoon. The Gossip sites rarely check their information. Exactly and the sub-editors have to find a headline to catch the eye, hence 'early Valentine's dinner'. party animal - not! wrote: Exactly and the sub-editors have to find a headline to catch the eye, hence 'early Valentine's dinner'. But since there are no nonstop flights from Los Angeles to any of the Berlin Airports (maybe that's planned for the new Berlin Airport which should have opened about three years ago but still is under construction ) you always have to Change flights, either in Amsterdam (KLM), Paris (Air France), Zurich (Swiss Air), Frankfurt (Lufthansa) or London (British Airways). Great pictures! Looks like it was a bit of a bun fight with all the photogs and journalists there, doesn't it? George Clooney is all smiles while carrying his luggage out of the airport after an international flight on Wednesday (February 10) in Berlin, Germany. The 54-year-old Hail! Ceasar star was joined by his lovely and stylish wife Amal as they prepare to attend the 2016 Berlin Film Festival. Stay tuned for more photos! That same day, Tilda Swinton was spotted touching down in the city, as did Josh Brolin and his fiancee Kathryn Boyd the day before. 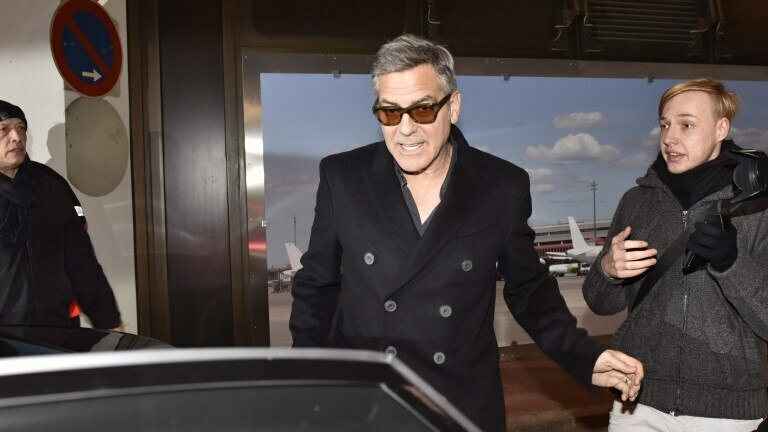 About this photo set: George Clooney is all smiles while carrying his luggage out of the airport after an international flight on Wednesday (February 10) in Berlin, Germany.